When used with an aqualis series reservoir (art. no. 45324 or 45325), pump adapter and reservoir form a virtually seamless unit. The sockets at the base of the reservoir slide into form-fitting receptables of the pump adapter and the gaskets on the sockets establish a watertight seal. When used with a reservoir, the threads on the side of the pump adapter must be used to connect the water loop. Additionally, a fill level sensor of the mps series is integrated into the pump adapter. The fill level sensor features an integrated microcontroller with USB and aquabus interface, a programmable alarm output and an external temperature sensor input. For monitoring and configuration, the aquasuite software can be downloaded free of charge. 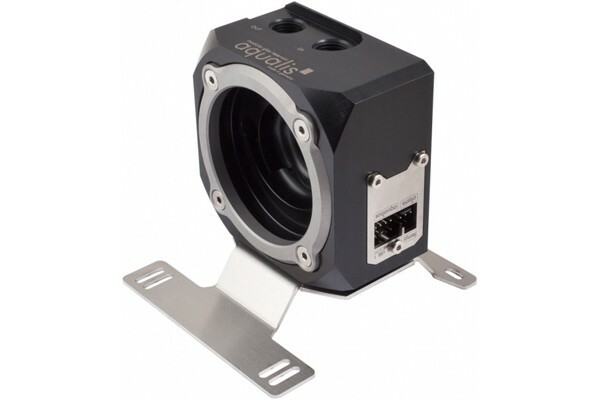 In addition to the USB interface, the 4-pin aquabus interface can be used to directly connect the flow sensor to an aquaero 5 controller (not included in delivery). The alarm output can be configured to be used as a rpm signal to be connected to a fan connector with fault detection (for example motherboard fan headers) or to be used as a switched output for example to connect a LED. Fill level and external temperature sensor input can be configured to raise an alarm. The external temperature sensor input is compatible with all Aqua Computer temperature sensors. A pressure equalisation membrane is included in delivery of the pump adapter and is to be installed into the top port of the reservoir. When used without an aqualis series reservoir, the fill level sensor is not operational! G1/4 threads for fittings can be used on the top and side of the pump adapter. Unused threads can be sealed with two G1/4 sealing screws supplied with the pump adapter. hallo wollt fragen ob der eingebaute mps einen Durchflusssensoren hat und welche er unterstützt art .71213 zb ? Würde ihn gerne mit agb 45325 nutzen da ich die pumpe 1012423 habe und die steuerung 1013416 einbaue,wäre das so machbar und was brauch ich da noch für das ich da alles auslesen kann? Die Frage ist etwas umfangreicher, daher rufen sie uns bitte direkt an und lassen sich direkt beim Support beraten. Das würde hier den Rahmen sprengen. Hallo kann man diesen Pumpenadapter auch senkrecht Monieren mit einem (natürlich dazu passendem) Ausgleichsbehälter und einer passenden D5-Pumpe sodass die Füllstandsmessung noch funktioniert?